Transit agencies are in constant battle with operating costs. Most fixed route operations only lose a few dollars on a single trip. But, paratransit trips potentially cost an agency up to $70. Normally, you wouldn’t keep this service operating if you were losing that much money on a single transaction. So, why do transit agencies? The simple answer is: Because they have to. Agencies that don’t get any subsidies for a service that, if not provided, can result in major fines, are examples of unfunded mandates. At the time of the Americans with Disabilities Act’s (ADA) inception, the cost of paratransit trips was approximately $15. The cost of paratransit trips has doubled over the past 20 years – the average trip cost is now $29.30. Couple that with the fact that people aged 65 and older are expected to make up 20 percent of the world’s population by 2030, and agencies are at a loss, quickly. With the increased cost and passenger rates on the rise, transit agencies are still expected to provide the same amount and quality of service, so it’s easy to see why public transit is pushing to circumvent the costs of operating paratransit. Partnering with transportation network companies (TNCs), like Uber or Lyft, seems to be the current solution. Working with TNCs is the 21st century version of the taxicab model – and is 20 percent cheaper than working with taxis providing the same service. This is an attractive benefit. TNCs can reduce the cost of a single paratransit trip to $13-16, which is massive savings compared to a door-to-door service run solely by the transit agency. With everything, there are pros and cons that you need to be aware of. There are some operational considerations when working with TNCs. TNCs, like taxi cabs, won’t work for everyone – either due to the passenger’s cognitive abilities or having a limited/unknown number of accessible vehicles. Additionally, as with taxi cabs, contractual oversight of non-dedicated drivers and the refusal (by some drivers) to accept service animals are legitimate concerns. Another consideration that needs to be addressed is the refusal or inability for TNCs to accept cash payments. Nevertheless, many transit agencies have overcome the operational challenges and have elected to use non-dedicated providers like taxi cabs and TNCs. However, many TNCs are working extremely hard to close these gaps. Lacking the ability to book paratransit trips in advance was a common issue when dealing with TNCs. This is actively being addressed to make services more accessible. It wouldn’t be surprising to see future changes to address other limitations. TNCs shouldn’t be seen as adversarial. The whole point is to move people and do so in the most economical way possible. Decreasing the cost of operations results in more money to be spent to improve your system. If that means you will have more money to spend on other things, these partnerships seem to be the way to keep passengers happy (and isn’t happier passengers the ultimate end goal?). Whether it’s in the fixed or paratransit side of transit, partnering with TNCs makes the door-to-door service a reality, expanding the definition of demand response. Orange County Transportation Authority (OCTA) is one agency that has seen success with partnering with TNCs. They’re expecting about 20 percent savings on the paratransit side, which accounts for 20 percent of their total operations. Today, it would be hard to find a bus that has actual steps to enter up and down the bus – but that’s what older buses looked like, prior to ADA regulations, making it impossible for anyone with a wheelchair to use a bus. But now, not only are there no longer steps, there are designated spots for wheelchairs on the bus. How things are mandated forces us to adapt. 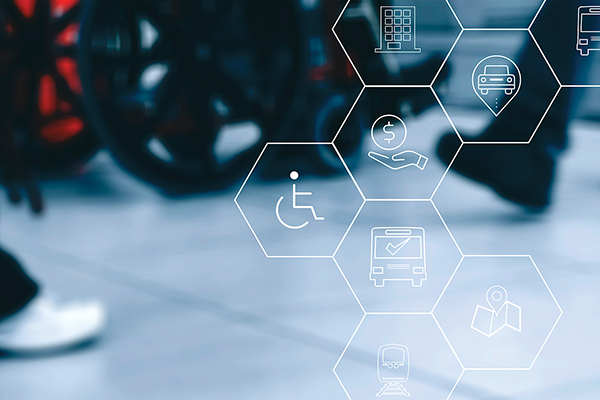 So, while fixed route and paratransit agencies try to catch up to the newest technologies and regulations, TNCs can help reduce operating costs, and be the bridge you need to access the newest features as quickly as they’re able to incorporate them. Both agencies and TNCs will have to adapt as the ADA and industry changes. This is all part of the goal to, as much as possible, move towards one system. While generally seen as being exclusive to paratransit, demand response is becoming the norm in all modes of transit. It’s just a matter of time before a unified system is put in place to become a complete door-to-door transportation service. The next question is: What can we do to bridge the gap? Jeff Zarr has over 30 years of transit experience and 20 years of project management experience in the public transportation industry, as well as providing paratransit consulting services for over 100 paratransit agencies across North America, Europe, and the UK. As the industry solutions manager, demand response, for Trapeze Group, Zarr shares his paratransit expertise and experience throughout the North American Demand Response industry. I really liked what you said about how regulations force public transit to adapt and be more accessible to people with disabilities. A friend of mine has recently come down with an autoimmune disease and is now using a wheelchair, so it’s important for her to have transport options. Thank you for the information about how AD regulations no longer have steps to get in and have designated spots for wheelchairs on the bus.